Season the chicken pieces with salt and freshly ground black pepper. Heat two tablespoons of the olive oil in a large frying pan and brown the chicken on both sides for 4-5 minutes. When all the chicken pieces are nice and golden-brown, remove them from the pan and set aside. Heat the remaining tablespoon of olive oil in the same frying pan and cook the chorizo for 2-3 minutes. Add the peppers, garlic, sage and thyme to the pan and cook for another 2-3 minutes. Tip the chorizo and peppers into a roasting tin and place the chicken pieces on top. Spread the lemon zest and juice from half a lemon over the chicken. Bake in the oven for 30-40 minutes, turning the chicken pieces halfway through the cooking time, or until the chicken is cooked through. Meanwhile, for the spiced aubergine, put the aubergines in a colander, add about ½ teaspoon of salt and leave to drain for half an hour. Heat 35ml/1fl oz of the olive oil in a pan and fry the red onions for five minutes, or until softened. Add the tomatoes and cook for a further five minutes, or until the tomatoes have broken down into a thick sauce. Season with salt and freshly ground black pepper, then remove from the pan and set aside. Add three tablespoons of the olive oil to the pan and fry half the aubergines for 4-5 minutes, or until tender. Remove the aubergine pieces and set aside to drain on kitchen paper. Add the remaining three tablespoons of oil to the pan and fry the remaining aubergine pieces for 4-5 minutes, or until tender. Return the aubergine and tomato and onion mixture to the pan and stir in the red wine vinegar, cumin, basil and coriander. Season to taste with salt and freshly ground black pepper and sprinkle over the pine nuts. 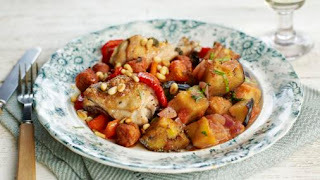 To serve, spoon the aubergine onto a plate and place the chicken alongside.